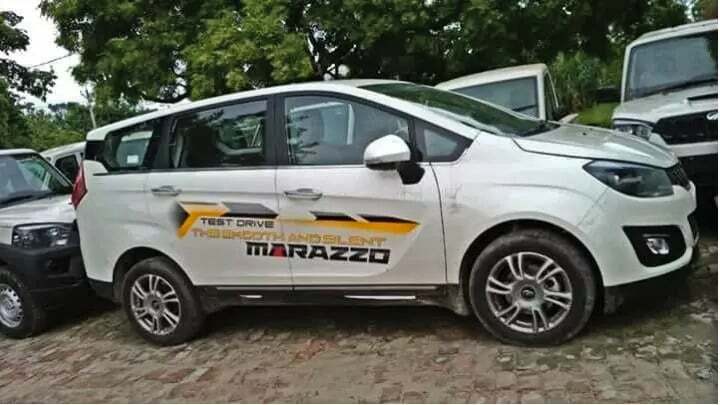 Ahead of its launch on 3rd September, Mahindra Marazzo has reached dealerships. Here, we have clear images of the MPV without any camouflage. It is expected to be priced between Rs 13 Lakhs to Rs 18 Lakhs to compete with Toyota Innova Crysta. The Mahindra Marazzo MPV is all set to launch on 3rd September. Ahead of its scheduled launch, it has started reaching various dealerships. Now, finally, we get the original leaked pictures of the full ready Marazzo. It has been spied at one of the dealerships in Wine Red and Sparkling White colours. Till now, whatever spy images and details we got, they exactly match with this ready model. It gets the chrome grille, twin projector headlamp, LED DRLs and resembles the Shark Design. From the outside, it gives a premium feel, owing to the Wine Red colour. The spied units get body colours ORVMs, fog lamps and a rising window line. At the rear, it gets huge tail light unit along with the chrome strip running just below the rear mirror. Although, some might notice that the rear side looks similar to the Xylo. The Mahindra Marazzo will come with a brand new 1.6 Litre mFalcon diesel engine. The engine produces 125 BHP of power and 305 Nm of torque. First, the MPV will come with diesel engine only. Later, it may also flaunt a 1.5 Litre petrol engine. The diesel engine comes mated to a 6-speed Manual Transmission along with optional 6-speed Automatic Transmission. The expected mileage of the engine is around 18 kmpl, which is good enough for an MPV. 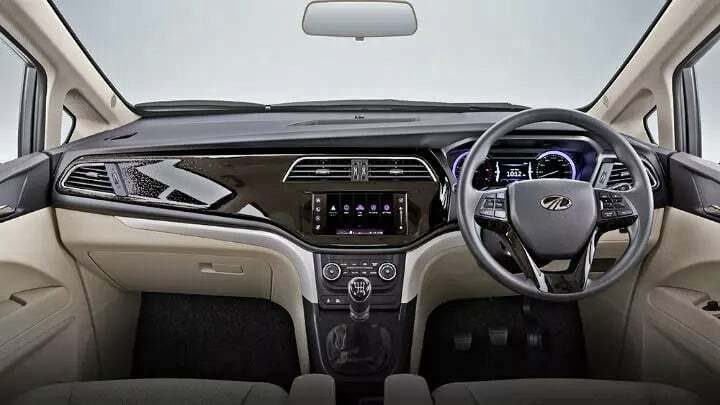 Recently, Mahindra officially released the pictures of its interiors with major features inside. 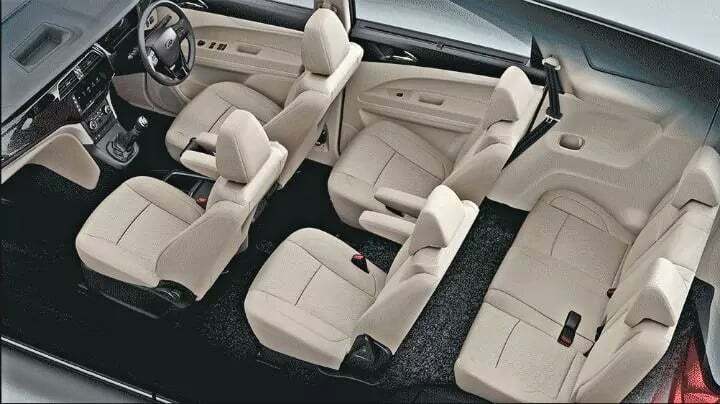 It comes with options of a 7-seater or an 8-seater variant. In the 7-seater variant, there will be 2 individual captain seats on the second row. The 8-seater variant will come with a 3-seater bench on the second row. In the interiors, it gets a dual tone black and beige combination. Features inside the cabin include steering mounted audio controls, auto climate option, touchscreen infotainment system and roof-mounted air conditioning system. These are not all the features that Mahindra Marazzo offers. More details of the features will come when it is launched. Safety features of the MPV would include Dual Airbags, ABS (Anti-lock Braking System) and EBD as standard fitments. The top-spec trims could get 6-airbags, Electronic Stability Program, Hill Hold and Descent Control and Rear Parking Sensors with a camera. Also, it is going to get a 4WD system. But, we don’t know where it will be optional or will come only in top-spec trims.